Far Cry 4's box art depicts a man wearing a lavish pink suit using what might be a religious statue as a throne. He has blonde hair and fair skin and his hand rests on the head of a man of color who kneels, passively, clutching a grenade in his hands. It's caused quite a stir. It's not like this is senseless controversy. The image and the context surrounding it—or lack thereof—is complicated, people's reactions equal parts bemused and confused. The image itself is a hand grenade that's already going off in slow motion, and I think Ubisoft's handled it poorly. Let's get the biggest misconception out of the way upfront: it's not a problem that Far Cry 4 might be interested in tackling uncomfortable or controversial topics. That's fine. That's important and, frankly, needed in big budget gaming, where we're drowning in so much substance-less fluff that it's all we breathe, all we expect, all we know. More often than not, games like Call of Duty treat other countries and cultures like playgrounds and playthings. There's no weight, no consequence to our actions. Barely even a mention of the people our characters might be affecting (rare exceptions aside). We may as well be giant children reenacting stuff we saw The Grown-Ups watching on TV and making explosion sounds with our mouths. Far Cry 4 can go wherever it pleases, and more power to it if it learns something important while it's there. I'm not saying games are wrong for giving us cushy, consequence-free murder getaways in exotic locales. I'm just saying that it'd be great to see something aside from that also. Nuance, however, is hard. Thing is, when you're tackling controversial or sensitive subjects, that's where the conversation happens. Between the lines. It's important to note that, so far, we haven't really seen anything of Far Cry 4. Ubisoft has provided scant details and this picture. That's it. Some people construed the picture as racist, an image drawing on hundreds of years of racial tension to provoke responses, get people talking, and, ultimately, sell a game. Some even thought the ostensibly (though actually not) white man was the game's main character. 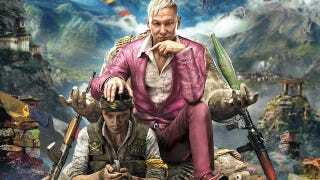 Others figured Far Cry 4's box art was following in Far Cry 3's footsteps, and therefore this man in pink was a villain subjugating a poor nameless native or perhaps even the character we'll be playing as. No one knew for sure, and naturally, heated arguments followed. You could, then, easily accuse people of making snap judgments. Jumping to conclusions based on next-to-nothing. Many of them did. And while people are in part at fault for doing so, I think this is really indicative of a bigger problem with the way major gaming companies market these things—drip-feeding us information, hoping we'll be just thirsty enough to beg for more, barely understanding what we've just had. Mystery! Reveals! Withholding key information! So you have this box art, floating around on the Internet, at best with a small blurb saying, "Far Cry 4 takes you to the Himalayas so you can shoot dudes and punch the abominable snowman and fashion him into a nice satchel" or whatever, but the image takes center stage. It is the one real window we have into this world, and it's hard to ignore thanks to extremely provocative imagery. People talk about it—on forums, in comment threads, on Facebook and Twitter. Of course they do. On Ubisoft's end, that was the whole point. To get people talking and speculating. To rev up the ol' hype engine on the way to some bigger announcement at a later date, and then another drip-feed of information until release after that. This is an instance in which that system falls apart—one that should give us reason to at least consider how big publishers want us to think about games in the future. It's all well and good to make a game An Event and get people excited, but there's a point at which you need to communicate more, especially as games aspire to involve themselves with more relevant or uncomfortable subject matters. Don't get me wrong: I think Far Cry 4 will still largely be about lighting everything on fire and causing great explosions. When it takes its first Bambi-like steps into the world with this, though, it's already trod into a realm once occupied by Far Cry 3, which at least aspired to a little more (and kind of fell on its face in doing so, but still). Whether erroneous or not, people have reason to believe there might be something amiss. So how did Ubisoft address that? By doing nothing until this week and allowing people's imaginations to run wild. Typing "Far Cry 4" into Twitter's search box yields "Far Cry 4 racist" as one of the top autocomplete results. There's community outcry going on here, but Ubisoft's barely made a peep. This in a day and age when gaming companies are all about community involvement and (alleged) openness. It's unfortunate that communication seems to come only at the most opportune/pre-planned times. That's rarely when it's most needed, a habit that leaves companies looking disingenuous—like they're not actually on the same wavelength as their fans even when they're trying to portray themselves that way. Heck, Ubisoft wouldn't even confirm who's developing the game, even as various outlets scrambled to dig up that basic information. It's kind of preposterous, right? When was the last time, say, Hollywood was like, "Now presenting Transformers XII, coming to you from Mystery Director X"? Moreover, revealing that Far Cry 4's team is (likely) being headed up by Assassin's Creed III director Alex Hutchinson would've been to Ubisoft's benefit here, as he made a game that starred a character from an oppressed background (Native American) and was critical of white Europeans and early white Americans. Basically, he's handled touchy subject matter before. His work on AC III was significantly more tactful than that of, say, Far Cry 3's creative team—which, to be clear, is probably not involved with Far Cry 4. Confusing? You bet. Sure would've been nice if Ubisoft cleared all of that up to begin with. Instead, however, Ubisoft skulked around in the jungles of silence until Hutchinson finally saw fit to weigh in by tweeting, "Just so it's clear for those jumping to conclusions: He's not white and that's not the player." Wow, that changes a lot. So why didn't anyone say that—oh, I don't know—as soon as these sorts of arguments broke out? Beats me. But even then, this response still offers very, very little in the way of information and doesn't really address the fact that people were legitimately upset or, indeed, why. So again, that's the score: radio silence for days, then only a little more than nothing. The end result? Rampant confusion in the community, (nearly) baseless speculation, and a lot of very upset people. Who wins in that situation? I'm struggling to understand how this benefits anybody. Unfortunately, Ubisoft seems pretty determined to stick to this path, promising only that there'll be more to come at E3. And while I'm singling out Ubisoft in this specific case, they're hardly the only company to ever do something like this. Ubisoft's failure to communicate clearly is yet another instance of games having trouble coming into their own as a culturally powerful medium—aspiring to Legitimacy, but only until it's inconvenient or not part of the marketing plan. Ubisoft is implicitly treating Far Cry 4 as a product first, everything else second. That strikes me as an extremely old-fashioned way of viewing and talking about games, and I think it needs to change. Games have power. Especially when they're on a stage where millions of people are watching, they're not "just dumb video games" anymore. I think, however, that the push and pull between 21st Century's Most Powerful Medium and "it's just a game; don't worry about it" shows through here. There's a legacy of acting like these issues don't matter because there's a legacy of acting like games don't matter. A cultural perception that they're "just games"—aka, toys or products. Problem is, games now make culture. Their influence reverberates through other mediums (especially film), creates news, causes trending discussions on Twitter and Facebook, etc, etc, etc. They're not just products or toys, and treating them as such creates an awkward gulf between what a publisher like Ubisoft is saying and what people are actually talking about. It's like two people standing in a room, facing each other, having completely different conversations. Both are entirely deaf to one another, and it's strange. It's dissonant. At worst, it's even hurtful—both for the perception of the game in question and, sometimes, for people. Moreover, it makes it harder to take a game like Far Cry seriously when it does try and address bigger issues if its own creators don't even consider that a key part of the experience. Once again, if games are gonna weigh in on controversial or uncomfortable subject matters, they kinda need to go all-in. You can't just pretend like your game matters until it doesn't. This isn't all that hard to change, either. It just requires a slight paradigm shift in the way these companies view games and, therefore, the way they communicate with us, their fans. Publishers (Ubisoft included) have shown a willingness to deviate from the marketing schedule time and time again when, say, an information leak occurs. But when people raise serious questions about the cultural impact and relevance of the only thing they've seen of a game so far? The only thing they've been provided to base opinions on? Silence. It doesn't have to be that way. All that's needed is a small change in priorities every once in a while. On that front, the ball is in game makers' courts. I only hope they consider what they're creating as important as it's obviously become. I really, really do. TMI is a branch of Kotaku dedicated to telling you everything about my adventures in the gaming industry (and sometimes other offbeat and/or uncomfortable subjects). It's an experiment in disclosure, storytelling, interviewing, and more. The gaming industry is weird. People are weird. I am weird. You are weird. Why hide that? Let's explore it.